Have you ever felt out of place? Have you ever felt like a square peg being forced into a round hole? 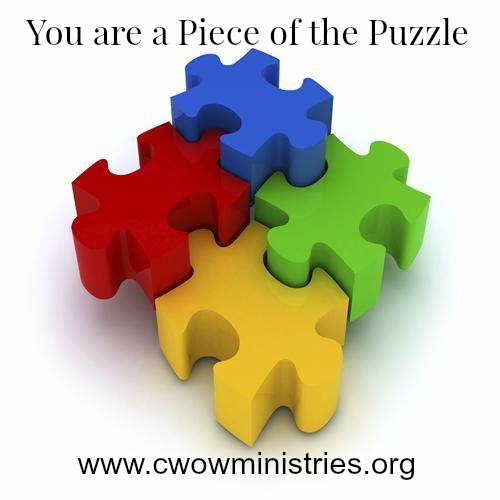 Well I have good news for you – You fit perfectly into God’s puzzle. Regardless of how you feel, God sees your purpose, value, and worth. You are God’s handiwork and He created you to accomplish something only you were made to do. When God spoke you into existence He did so with the same intent and purpose as in Creation. On the first day of Creation when God commanded light to come, it came without hesitation. On the fifth day of Creation when God commanded the sea to be filled with fish and the air with birds, it happened without hesitation. As a testament to God and evidence to us, the sun shines, the fish swim, and the birds fly today. This is also evidence that God prepared you in advance for what you are facing now. There is nothing that can stop you from reaching your best. Nothing God does is for the short term. He creates and builds things to last. Everything that God does has a purpose. He does not make mistakes or junk. Every word God speaks accomplishes what it was sent to do – His words have power. God spoke your name and you were conceived. God’s words, as a living force, pursue their intended target until the job is done. God will complete the work He has begun in you. We are all a part of God’s process. Some of us plant seeds in the garden of life; others of us are assigned the duty of watering the seeds. Both these roles work together to build, edify, and encourage the Body of Christ and those around us. The process of salvation, redemption, and discipleship that we are all involved in does not end with us, it must continue on for generations to come. We must invest in one another so that this process continues. We must value and encourage one another and praise God for the way He has made us all. We must remind ourselves and each other that no matter how we feel or what shape we are in that we are God’s handiwork and we fit perfectly into His puzzle – the Body of Christ.